At Notre Dame Jr/Sr High School, international students develop deep friendships that last a lifetime. Notre Dame is fun, safe and academically challenging. Each academic year, the International Program at Notre Dame provides international students with the opportunity to become valued members of the Juggler family and immerse themselves in American culture. Students are challenged academically in order to prepare for acceptance into elite colleges and universities. Our entire student body benefits from the gift of cultural diversity and exchange within our own community. Notre Dame Jr/Sr High School accepts a limited number of International Students each school year. International students' applications are reviewed by the school's Admissions Office and are accepted based on their academic and English qualifications. 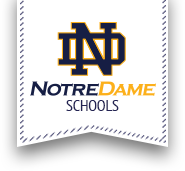 International students must demonstrate strong English skills (TOEFL English proficiency exam or equivalent required plus a Skype interview/examination) as all of the classes at Notre Dame Jr/Sr High School are taught in English at an accelerated rate. The goal is to see all international students be successful at our academically rigorous school. Applications for the 2019-2020 school year (beginning Fall 2019) will be accepted up to July 31, 2019. Currently, applications for the 2018-2019 school year will be accepted on a rolling admission basis.